To start, spray in texturizing spray to add texture to the hair. This helps the knit hold on. On both sides of the head, do a French braid, which is where you add pieces of hair into the braid on the side strands every stitch. Add hair in until you are grabbing pieces from the crown. Stop and braid down. Do a simple twist bun with the rest of the hair, put the hair in a pony tail, wrap the hair around the base and tie with elastic. To finish, wrap the braids around the bun, pinning them off in place. Simply start by brushing the hair so it’s smooth. Divide the hair in half, vertically. Do a simple French braid on one side, adding new hair to each strand every stitch. Temporarily tie with elastic, then do the same to the other side. Take the elastic out of the first braid and tie them together. Then you can do a messy bun or a pony, whatever you like. I opted for a bun on the short hair because the pony tail stuck out mostly due to the hair being shorter. Begin by making small, normal braids around the hairline. Bring all the hair into a ponytail. Start a fishtail. This is done by splitting your hair in two, then bringing hair from the back sections to the front, and into the opposing section. Repeat this action all of the way down the hair. Try to keep the fishtail tight to prevent hair falling out. Finish the end with a clear elastic. You can put a scrunchie in, but that is optional. To start, tame the hair with a serum. 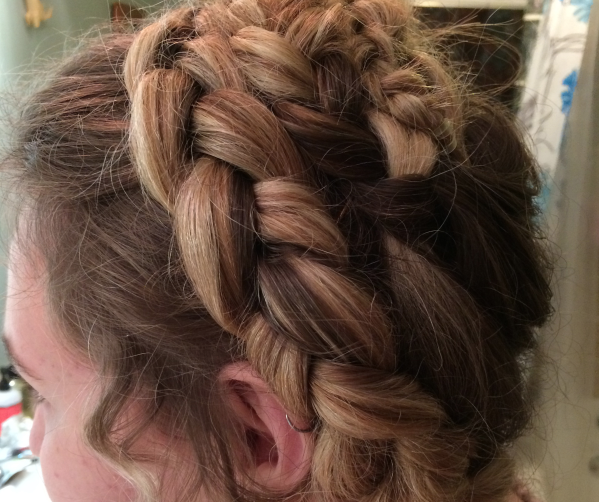 Begin the process of a Dutch braid across the front of your head. 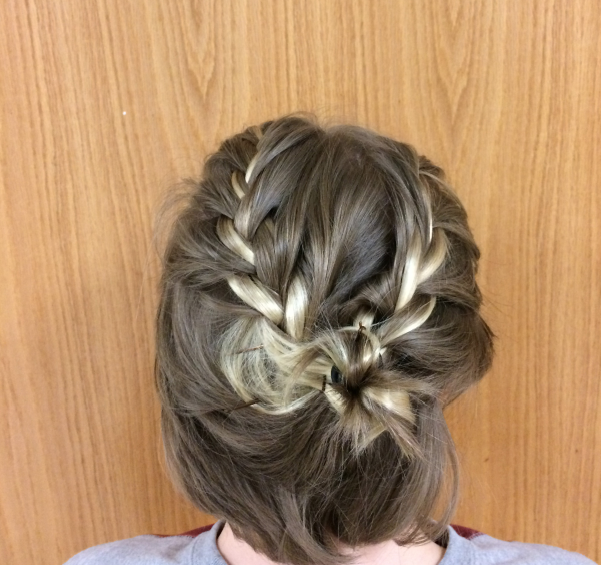 A Dutch braid is like a French braid, but braid the strands under each other and not over. 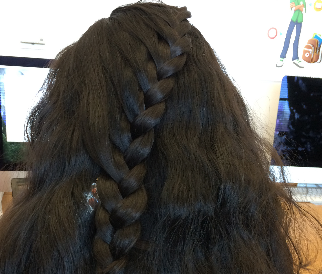 In this braid, only take half of the hair. Divide the rest of the hair in half and do two normal braids down the head. Don’t forget to put elastic at the ends. Pin the braids next to the Dutch braid, so that they overlap. Pin them in place, tucking the ends under the other braid. 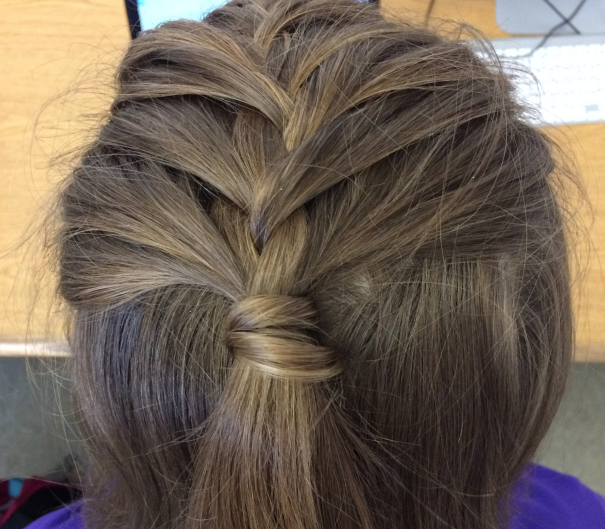 Then simply wrap the rest of the Dutch braid around the head. 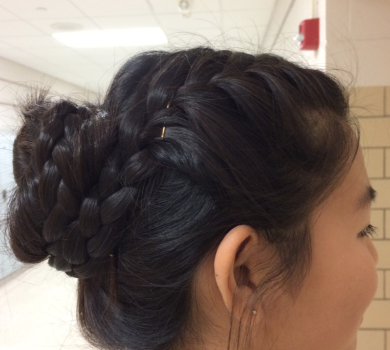 To begin this style, grab three strands from the front of the head, and start a French braid. Take peices from each side and add them to the outside strands. Repeat until you get to the middle of the head. 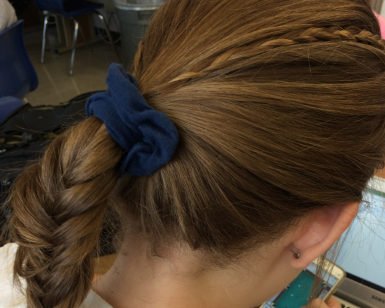 Instead of braiding down, tie it off in the middle of the braid. Take a piece from the new ponytail, and wrap it around the hair-tie. Pin the hair in place with a bobby pin, but you don’t have to wrap the hair around if you don’t want to. Start by putting a smoothing serum in the hair to lock down the flyaways. (I used Garnier Sleek And Shine). Next, take a small section of hair near the front of the head and do one stitch of a braid. The next time you do a stitch, add in a piece of hair near the top of the head, not adding any on the bottom. Continue in a diagonal along the head, going across the crown and ending in the back. Proceed normally, braiding without adding anything in. Finish off with a clear elastic.